Here today on February 22nd, the theme around the genealogical community and around the internet is Thinking Day, and — in honor of the joint birthdays of Lord Baden-Powell, founder of the Boy Scouts, and his wife Olave, who was involved in the Girl Guide and Girl Scout movement — we are all to think about oiur own scouting experiences and give thanks. That particular focus leaves The Legal Genealogist pretty much out in the cold. You see, back in the dark ages when the dinosaurs were roaming the earth and I was old enough to be a Scout, one thing America was producing in enormous numbers was kids. Yep, I’m a Baby Boomer, and there were (and are) an awful lot of us. There were, just to put this into some sort of context, some 38 or so kids in my third grade class and more than 40 in my fourth grade class. And it got worse: for the first few months of my fifth grade year, until the new elementary school opened, there were more than 50 kids in that classroom. Now my older sister, just two years older, had “escaped” the worst of the crowding by going off to the brand new junior high school — where she was promptly put on double sessions — one set of kids went from oh-dark thirty until about noon, and another set of kids went from noon until after dark — until the other new junior high school opened. And with all of these kids being produced right and left, the one thing there wasn’t an overabundance of was grownups to do things like serve as Girl Scout troop leaders. Yes, our mothers were more likely at home than at work, the opposite of today’s demographic, but they also were more likely to have two or three other little kids tugging on their aprons. They didn’t have a whole lot of time to handle a scout troop. Basically, you had to hope that when you were the right age to be a scout, there was a troop in your area that could take you. And that wasn’t always a sure thing. That’s where Diana’s two extra years on me did work out for her. She came of age for scouting when there was an opening in a troop that also involved the children of the local Baptist minister, Rev. Lloyd Williams. Diana and Ruth Williams both were in that Girl Scout troop, and they have been friends now for half a century. It’s a lovely thing to behold. There was a Brownie troop that had an opening when I got old enough, and, presumably, I spent a happy year or so there, doing what Brownies do, until I “flew up” or graduated to the ranks of the real Girl Scouts — from the brown uniform to the green. I say presumably because I don’t really remember all that much about being a Brownie. What I remember is The Problem. You see, when I flew up from Brownies to Girl Scouts, there was exactly one troop anywhere within a distance that I could get to that had room for another scout. And it met right after school. On Thursdays. In the fall of 1960. And, right after school, every Thursday afternoon, that fall of 1960, where was I going to have to be? Rushing right home to babysit my younger brother and sister. I still remember being told about that new responsibility. I remember the disappointment of not being able to be a Girl Scout. I remember watching the girls who’d been Brownies with me come to school in their new green uniforms, and being so disappointed that I wasn’t wearing mine. And I also remember, vividly, forgiving all that disappointment by the end of that fall. You see, the reason I had to rush home was that my mother had a doctor’s appointment. Every Thursday afternoon. In the fall of 1960. Until Thanksgiving Day, 1960, when she still had to see the doctor, but not for a routine appointment. And when she came home from that doctor’s visit, she brought with her my brand new baby brother Fred. With whom I had dinner last night, along with our younger brother Bill, plus wives and children. And all I can say is … there are some things that are better than scouting. 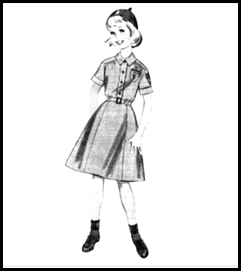 “Brownie Scout, 1956,” Girl Scout Uniforms, Girl Scouts (http://www.girlscouts.org : accessed 22 Feb 2014). Oh, Judy, I never fail to enjoy your writing! Sorry you missed the uniform. I’m older, born before you Boomers, so had no trouble flying up to the green uniform – but Girl Scouts really wasn’t all that much fun and I thought I looked funny in that uniform. They came in standard sizes and I was never a standard shape. A baby brother is so much better! I had only sisters…. I eventually decided I probably wouldn’t have made a good scout myself (all that “obedience” stuff…) but yeah… a brother is an awfully good “consolation” prize. And since mine are your DNA cousins, I can loan you one (or two) (or five…). Sorry you didn’t get to be a Girl Scout, Judy. I stayed in scouting through high school, then worked summers through college and grad school as a camp counselor all over the US, then became a scout leader. It was all great fun and provided many opportunities for travel and learning that I would not otherwise have had. At least somebody in my family got to do it, Ginny… and Diana got a lifelong friend out of it. Personally, I think it’s a bit presumptuous of them to expect us to remember our Scouting days and give thanks. Scouting was one of the most miserable experiences of my life! I’ll spare you all the details, but the one thing it did for me is provide a head start to the ROTC drill manual (my troop was by no means heavy on such things, but whoever had flag detail for the meeting did have to know commands such as left flank, column left, and so on). Most folks I know who were Scouts — Boy or Girl — enjoyed the experience, Dave. But as with any human endeavor there’s that old different strokes for different folks thing to factor in. One of the few regrets I have is not being a Boy Scout. I was a Cub Scout but never a Boy Scout: my parents never really encouraged me to join. So I was really surprised to learn recently that my grandfather was a District Commissioner and my father was an Explorer Scout who attained the rank of Life Scout. I’ve been busy the past two months researching my family’s involvement with Scouting, and am waiting for a reply from the Council they were involved with who seem to still have records for my grandfather and father. Here in Yellowstone, I was contacted this fall by a Scouting official wanting more information from the park’s archives about the “Eagle Scout Trail.” He believed that it was built by Scouts in the 1920s. Since none of us (including the park’s longtime historian) had heard of such a thing, we were sceptical. However, it didn’t take me long to find records verifying the story! This spring my co-workers (including one of the museum curators who is an Eagle Scout) and I hope to find remnants of the “Lost” Eagle Scout Trail. P.S I’ve been considering becoming a merit badge counselor. One of the badges am thinking about helping the Scout with is for genealogy. I’m sure the Scouts would be thrilled to have you mentor the genealogy badge… and oh man… if you find that trail, or even if you have fun looking for it… how ’bout a guest blog post complete with pictures??? I’ll let you know if we find anything, but we wont be able to get to that location until May. Too much snow! Oh I remember vividly the boy-or-girl moments, too, Debi! When my brother Paul was born, my sister and I each had a sister — we wanted a brother! By the time Fred was born, we had more than one of each!